Lithuania is commemorating a day of Freedom defenders. 17 years ago the Soviet troops – the Pskov division and the KGB elite Alfa Special Forces attempted to crush the newly reborn Lithuanian state. Some died from the shot wounds; the Soviet tanks crushed some. In total 14 peaceful civilian freedom defenders lost their lives, hundreds more wounded. The January 13 events are deeply ingrained in the Lithuanian’s hearts. I would place this date to one of the most important events in the Lithuanian history. I would call it Lithuania’s ‘Winter War’, which came some 50 years later. Same like the Fins in 1939 decided to fight with the much larger enemy despite the fears that the Soviets swiftly will crush the resistance. The Lithuanian Winter War in January 1991 was a crucial for the survival of our nation as the Žalgiris battle in 1410, as the Lithuanians fights against the Bolsheviks in 1920, as the Partisan War after World War two. 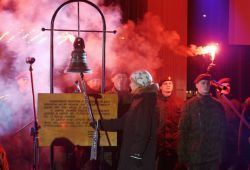 The January events as one Lithuanian commentator noted, materialised and institutionalised Lithuania’s freedom, which was declared in March 1990. This day is a pride of Lithuania, and the probably the most important day in my life. In this day a teenager turned into a responsible citizen of a free nation, who was ready to sacrifice his life for motherland and freedom. I had a honour to be amongst thousands in the square in the front of the Parliament, listening to the creaking Soviet tanks coming after they already ‘done their duty for the Soviet motherland’ next to the TV tower. We heard what happened some hour ago in the front of the TV Tower, we new that the soldiers were using the real bullets; we knew that the tanks crushed the people. At that moment a rumour had it that during the storm of the TV tower the Soviets killed hundreds of people. And hence, we were waiting for those same Soviet solders to come to the square, shoot at us, crush us, and take away from us not only our lives but also our freedom. Freedom from all of us in this square and from all in Lithuania; in the towns and villages who gathered to defend institutions which defined our statehood; the post offices, the TV and radio studios, the train stations, the municipality buildings. All of us, teenagers who still went to the school, like myself, the pensioners, the students, the teachers, the factory workers, the bus drivers, all of us! However, the Parliament was the heart of our statehood, the square around it was a human shield which had nothing just their love of freedom, motherland, believe, hope. Our only weapon was against the Soviet tanks and the Kalashnikovs was our bear arms and our songs, which made a huge crowd as a one body. Your hear the squeak of the tanks, you feel the vibrating ground under your feet, you hear a pledge form the loudspeaker coming out of the Parliament urging the old, women and children to leave the square. No one moves an inch. You hear the voice of a priest Grigas, who gives to the people last redemption of signs. Not to the soldiers who are given orders ‘take the parliament by all means’, but to the people whom those soldiers peppered to slaughter. Then you hear voice from the loudspeaker to move away from the Parliament’s glass walls, since the falling glass will heart many. Yes, we heard they the tanks were shooting while storming the TV tower. This was the purest and the strongest feeling I have ever experienced. It makes my eyes water when I return to those moments in January 13, 1991. A miracle appeared – the soviet tanks stopped, the soldiers retuned to they barracks and the bloodshed was avoided. A little nation became a big nation, the Soviet Empire collapsed. I thank God and my destiny for giving me an opportunity to live through those honourable moments and perhaps understand what a freedom defender felt in the Baltic Forrest during the resistance to the Soviet occupation, or a simple Finish solder facing advancing numerous Soviet troops in the Winter War. Long live momories of those fallen 14 heroes who sacrificed their lives in January 13, 1991. Entry filed under: Baltic States, Estonia, Finland, Latvia, Lithuania, Northern Europe, Politics, Russia, Totalitarian regimes, Uncategorized. A moving post. Ačiū, Ruslanai! Our youtube mini-series Red Proxy features “January Events” as the subject of episode 1. chk it out. Magnificent web site. A lot of helpful information here. I’m sending it to a few buddies ans additionally sharing in delicious. And obviously, thank you for your sweat!